Hello. My name is Miro. And i'm a guitar effect circuit building addict. I got a bunch of AD712s coming on the mail, but didn't have one at hand, so i subbed it with something as expensive - the TLC2262. Circuit works. I had to swap tone lugs one and three, since those seemed to be in reverse. Used B1M for gain, and it works beatifully. It's just clean signal with gain at zero, and it shoots up after first 10% - no stopping until the end. I'm once again out of B100K pots, so i used C100K for for volume. It works perfectly. Rather a C100K here than A100K. Heh. That box is going to get sanded. Plus i'm going to change some pots before boxing this again. A(or B)100K will be ok for volume - C taper is too steep. And the gain increase that really comes with 1M pot is so slight, that i'm going to put in A500K so i can enjoy the sweet spots of lower gain settings. B20K will probably be better for tone, as it's sweet spot is 95-100%. I'll tinker with this some more, and let you know once i think it's ok.
What happened when you tried the 500k pot? I did this build with that same A500k and the gain knob isn't capable of low or medium settings. Any other IC I can try? 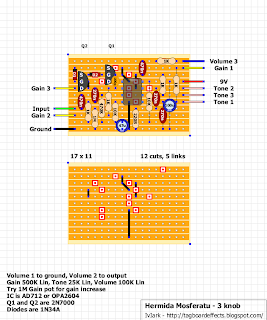 Nevermind, just looked up pinout and it seems just about any dual op amp will work :) Thanks for the layout! Guys, where's the best place to source low voltage 270n caps? Is this schematic up to date now? I saw that mirosol said he thought the pins on the IC were out of order somehow. You said you would "update and tag". Wondering if this graphic is good to go, planning to build this in a few days. Thanks! Thanks for the mighty quick response IvIark. I was wondering if the type of capacitor used matters in any of these applications. I know ther are slight difference people claim to hear in the types and also longevity, I've read your and Beavis' articles on this. What I'm wondering is will anything not FUNCTION by using one type vs another of the same value? Like on this schematic for example, you draw some capacitors as thick red-colored mylar types, then other ones as those blue circular radial types, on your SHO schematic I even saw a big yellow one. What gives? I wish there was a chart explaining what type of capacitor you're recommending in each spot and why. PS I found this website last night and have already created a 3D model and ordered all the parts for a dual-effect SHO and Mosferatu in a 1590BB. I'm so excited! 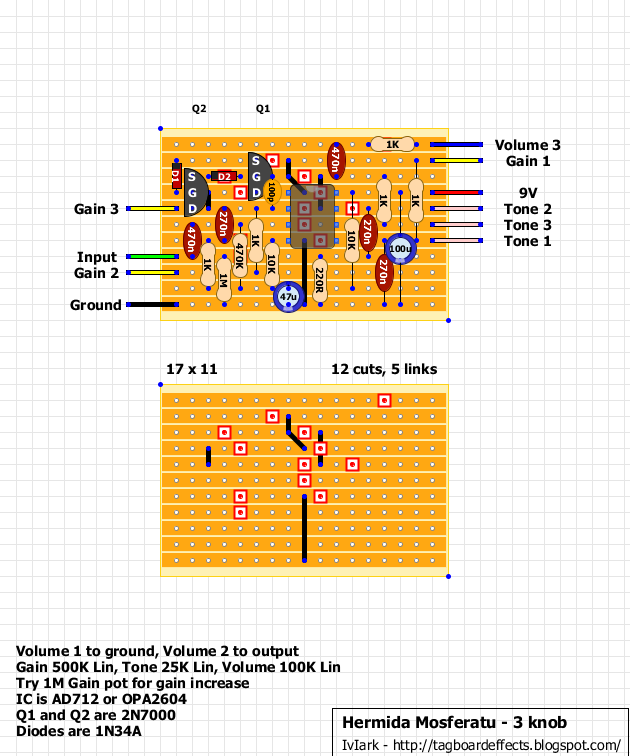 Am I missing anything by planning on just running this schematic next to the other one using the "Dual effects" offboard schematic on the offboard page? Should fit in 1590BB no problem? If you can hear any difference at all it will be subtle at most and isn't anything to worry about IMO. Buy the caps that fit the spans best, box caps are good but polyester with longer leads like Panasonic or Xycon Greenies are better because you can span larger gaps with them. Multilayer ceramics are also very good and are very small which comes in very handy sometimes in these builds. In the layouts I've done the caps you can see represent what I intend to use in the pedal. Remember I started doing these for myself only originally and so kept the cap size accurate to what I had in stock so I could estimate how big they will be in the circuit a bit easier. So the smaller light brown caps represent multilayer ceramic, red poly types are Panasonic ECQ series which I've got full sets of. The larger yellow type are polyester axial, blue circular are radial electrolytics (generally for values over 2.2uf), longer blue ones are axial electrolytic. Oh and yes you'll get both of those in a 1590BB easily. Ok, thanks again. Question, what was your source for this particular schematic? Did you look inside a 3 knob mosferatu and just go off of that? Wondering how accurate/similar it is. Also got a 20k tone pot instead of 25k. For some reason Tayda didn't stock a 25k. I assume that won't matter much either, but if i'm right it will make it sound darker? Wonder what it will be like stacking a mosferatu into a SHO, I've heard one is really dark and the other one adds highs. Really, the only reason i'm building them together is because I wanted to try both effects and am running out of space on my pedalboard. It's from a schematic posted on freestompboxes from an accurate trace. Most of the schematics for the more well known effects on here originate from schematics on FSB, where they are traced by various members. If a value isn't known for definite then I tend to mention it in the post and give a recommendation, advising people socket that position and experiment with values to get the sound they like best. Mark, I got Tantalum 470n caps for the two positions that value is called for. I don't know which side should be negative and which side positive? The 470n at the input will have the negative leg on the bottom at the input wire, the 470n at the output will have the negative leg at the top. I am not able get 270nF Caps, so thinking of either going with 220nF or 330nF. Which would be a better alternative, or how would each replacement change the circuit behavior? 330n. That'll let a bit more low end through. If it feels too bassy, then swap it for 220n. anyone had a problem with this squealing? I used and OPA2604 chip, 220nf caps in place of the 270nf and the 1M gain pot, the sound is bang on, pots work as they should but there's an intermittent high pitched squeal when the pedal is engaged and im not playing anything, could it be something catching the enclosure?